Broken capillaries treatment for your face & body with laser or IPL. 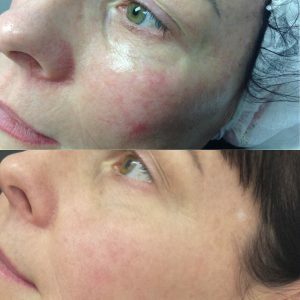 IPL (intense pulsed light) – pulses light onto your skin, targeting superficial capillaries and diffuse redness to restore an even colour to your skin. Both women and men hate excess redness in complexion. Most broken capillaries and facial redness are easily treated with IPL, a non-invasive laser treatment. The Cutera Limelight targets the broken capillaries that cause your skin to appear red. Are You Concerned With Broken Capillaries? At SkinRevision we use the Cutera Limelight, a medical grade IPL machine capable of treating diffuse facial redness and broken capillaries up to 1mm. As local cosmetic skin specialists in Brisbane for over ten years, our team at SkinRevision offer you a free assessment to discuss your concerns and treatment options. Call 3350 5447 For A FREE Consultation orEMAIL Us With Any Queries. ‘Broken Capillaries’ is a common term used to describe facial capillaries that become visible at the surface of the skin. They commonly occur on the side of the nose, cheek and chin. Broken blood vessels also occur on other areas of the body including the neck and decolletage. Broken capillaries that occur anywhere on face and body can be treated. Broken capillaries are merely superficial capillaries that become visible because of damage to collagen, elastin in dermis and blood vessel walls. This damage is predominantly caused by sun exposure, and in Brisbane, our high UV places us at risk of developing facial capillaries and redness, broken blood vessels on the decolletage. What Makes You Prone To Facial Capillaries? Hormonal changes during pregnancy or while taking the pill. IPL can be used to treat facial capillaries on broken blood vessels on the neck and decolletage. It can be used in other body parts but is not suitable for treating broken capillaries on legs (spider veins). IPL is best for treating diffuse redness from facial capillaries, of isolated broken capillaries up to 1mm. Vascular lasers, diathermy or injections may be employed depending for the larger broken blood vessel. IPL uses a broad spectrum of visible light while lasers use a single wavelength of light. Consequently, IPL is suited to treat combinations of sun damage problems. Diffuse redness, broken capillaries and pigmentation are addressed simultaneously. Lasers are more precise but less versatile and more appropriate for larger isolated capillaries, especially larger capillaries and veins around the nose. Combinations of treatments can be used. With Cutera IPL you will see a reduction in redness after 1-3 treatments. The number of sessions varies according to the underlying cause and severity. 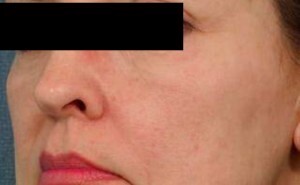 Intense Pulsed light treatment can be useful to treat facial capillaries. We use the Cutera Limelight IPL for diffuse redness, rosacea, fine facial capillaries as well as isolated capillaries up to about 2 mm thickness. There are many great lasers for broken capillaries. These include V laser, Excell V or V beam laser. Lasers and IPL can be used alone or in combination. With larger broken capillaries on the face, especially around the nose laser is the preferred method of treatment. Diathermy can also be used for larger vessels. However, there can be risk of scarring with this. 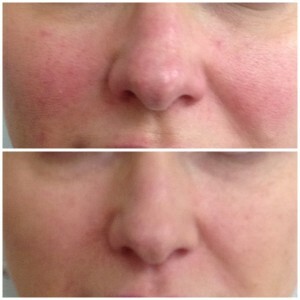 Treatment of Redness from Rosacea. 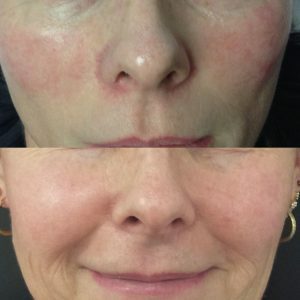 Redness caused by rosacea can be treated with IPL or laser. It minimises the redness by shutting down the surface capillaries. However, to manage the inflammation and slow the progression there is a new rosacea treatment called Kleresca. Nose veins, Spider Veins are common terms used to describe thin surface vessels that become visible at the side of the nose but can affect the entire nose, cheeks and chin. Treatment Of Nose Veins with Intense Pulsed Light & Laser. Spider veins around the nose tend to appear as faint lines that streak onto the cheek whereas veins on the nose tend to be more like a web giving the nose a diffuse red appearance. Intense Pulsed light treatment can be useful to treat these vessels. We have a Cutera IPL system that is effective for treating nose veins up to 2mm, diffuse redness, facial capillaries and rosacea. However, lasers are often more appropriate for treating vessels nose veins or larger veins on the face. Free Assessment With Our Therapists. Call us on 3350 5447 for your free consultation or email any queries. There are skin care ingredients that can calm an inflamed appearance and increase the integrity of your skin. Though there is no cream for broken capillaries, (you will require laser or IPL for these), a lot can be done to keep your skin calm and content. We recommend Dermaenergy ‘Calm The Harm’. It contains NIACINAMIDE (Vit B 3), as well as the potent anti-inflammatory and anti- irritants, BETA GLUCAN and OATMEAL and lastly SYMCARE – which helps with skin barrier repair and anti-redness. Niacinamide is the hero to deduces redness in the skin and helps prevent skin flushing and rosy cheeks. Rosacea starts as a tendency to facial flushing. Over time with repeated flushing, the superficial capillaries can become permanently dilated. 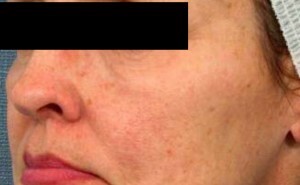 The face gradually has permanent diffuse facial redness or broken capillaries. Skin care and medical treatments used early can help prevent the progression of rosacea. However, once you have the fixed appearance of broken capillaries or permanently rosy cheeks, IPL becomes effective to restore a creamier complexion. 1-4 treatments are required to return an even colour to your face. How To Get Rid Of Broken Capillaries? In men, superficial capillaries and redness tend to be restricted to facial areas on the cheeks and around the nose. In women, it can extend to chin neck and décolletage. The first step is to get a FREE assessment at our Brisbane Clinic. We offer all our patients the same high standard of care and attention. When you present at our clinic our staff will work with you to assess the extent of your capillary damage and establish a plan for treatment to improve them. Call Us On 3350 5447 For A Free Consultation. or EMAIL Us With Any Queries.